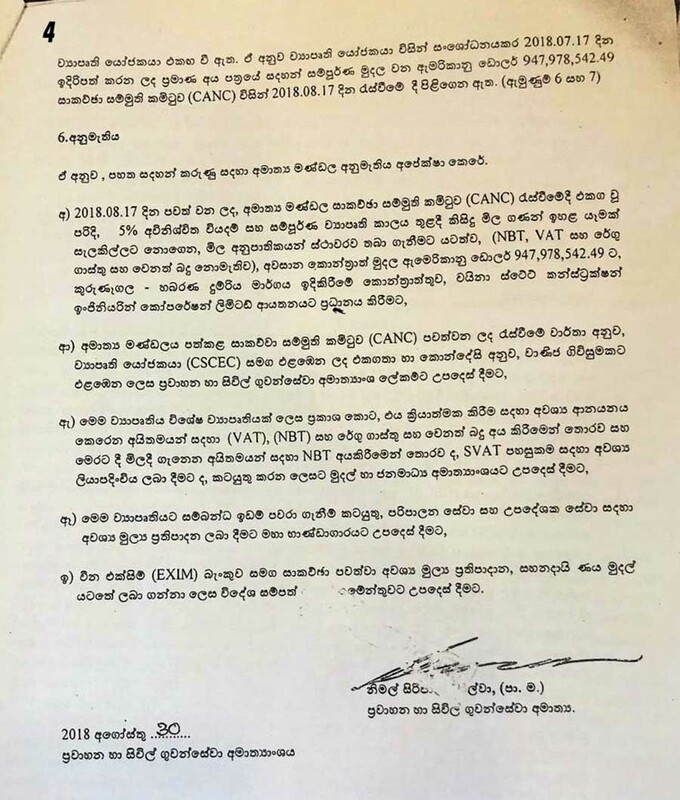 LEN - www.lankaenews.com | Gamarala determined to break corruption records of Rajapakses before his exit- Rs.20 million per km of railway line..! Gamarala determined to break corruption records of Rajapakses before his exit- Rs.20 million per km of railway line..! -Corruption tainted cabinet paper …. (Lanka e News -28.Sep.2018, 11.30PM) Like how a devil when it knows it is going to be chased away inflicts the maximum damage before its exit , our venally inclined president Pallewatte Gamarala too who is now precariously clinging on to a 4 % popularity base , and is due to be packed and sent home in 15 months has made all the arrangements to selfishly gobble up many billions of rupees via the so called project to build a railway line under his ‘Pibidemu Polonnaruwa’ program based on reports reaching Lanka e news. 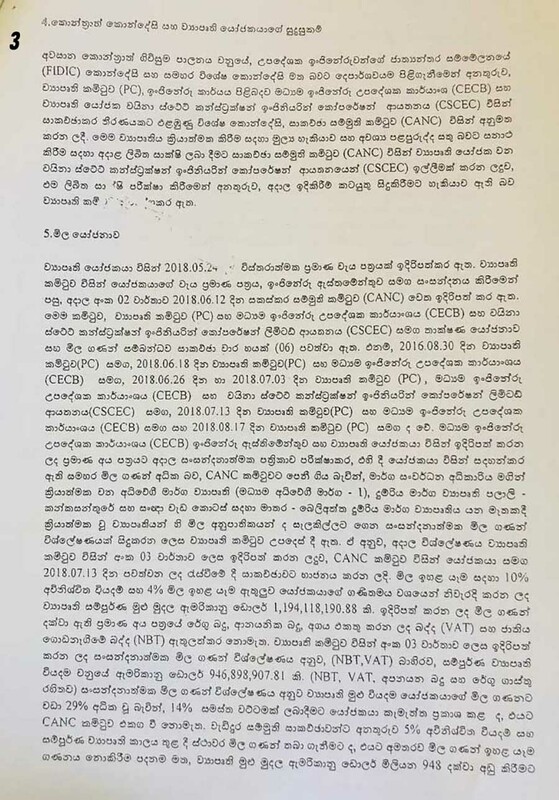 The president prior to his leaving for New York submitted a cabinet paper hurriedly to award the 88 kilometer long railway line construction from Kurunegala to Habarana via Dambulla to ‘China State construction engineering Corporation Ltd.’ at a cost of Rs. 161,160 million (US dollars 948 million) , without duly following the formal tender procedure . Based on this staggering cost , to construct one kilometer of the railway line it will cost about Rs. 20 million. That is Rs. 20 million approximately is being spent for the construction of a length of railway between just two railway sleepers. It is therefore being widely and justifiably questioned whether this railway line is being made of gold going by the colossal amount that is being spent by Gamarala? Mind you this aforementioned expenditure does not include the amount to be paid as compensation to the lands acquired for this construction . Before the cabinet could hold a discussion in this regard , the cabinet proposal has been passed stating that ‘ it is ratified’ . The relevant cabinet paper is herein..
Cuddling the gold even before the object to be made is even thought of .. The president has extolled this railway line as ‘a most paramount and primary necessity ’ for the transport of goods that are expected to be produced in the proposed export zone which is to be established in Kurunegala and Habarana. The most bizarre part of this much vaunted project of the president is , even before a single export zone is commenced , Gamarala is eager to build a railway line saying it is for the export zone (non existent) spending many billions of rupees ! This is like spending billions on the justification it is for a castle to be built in the air !! There is already a railway line 113 kms. long between Kurunegala and Habarana via Maho . The length of the proposed railway line via Dambulla is 88 kms. long. In other words billions and billions of rupees are being spent (wasted) just to secure a 25 kms. distance gain while it is a well known fact , currently the trains ply from Kurunegala to Habarana travel in one direction twice per day, or in two directions four times a day. One train travels during day , and another during night. A new railway line is necessary only if there is no possibility to include more train journeys to those already in existence. While there already exists a train service comprising four journeys during 24 hours of the day, it is a matter for rude shock how Gamarala can consider the new railway service costing a staggering Rs. 161,160 million as a ‘paramount and primary necessity’. The population of Habarana and its environs is sparse – only about 10,000 people live there although Gamarala is spending such a colossal amount .Of course it is true there are heavy traffic snarls along the main route between Dambulla and Kurunegala but the cabinet paper does not relate to the traffic congestion on the roads. Therefore what is more important is to widen the Dambulla – Kurunegala road to have four lanes to ease the vehicular traffic congestion rather than the construction of a railway line. Even if the entire road cannot be broadened , at least the areas where there are paddy fields and shrubs on both sides shall be broadened to have four lanes , in which event the traffic congestion can be eased 100 %. To effect that improvement it would not cost even a minute fraction of Rs. 161160 million. Therefore Gamarala leaving aside all this , and seeking to construct a railway by entrusting that to China via a loan obtained from them even without calling for tenders duly is most dubious and disastrous from the standpoint of genuine national interests. 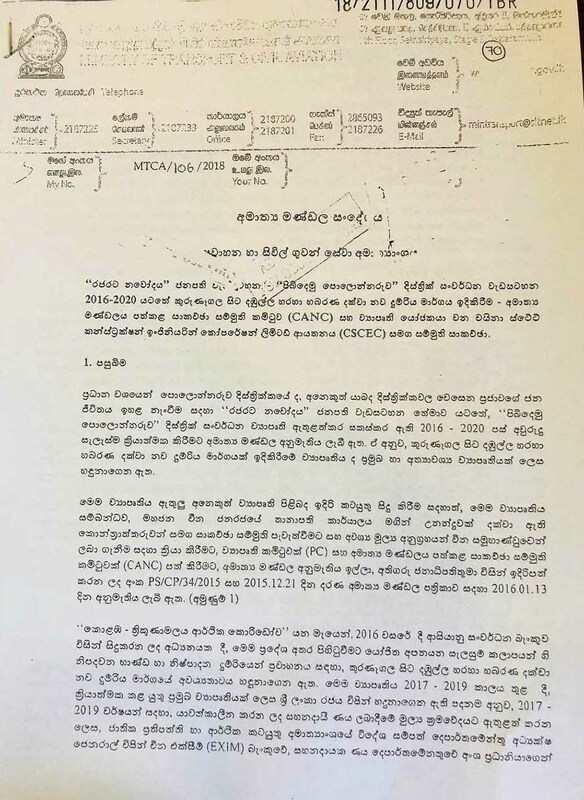 This diabolic dastardly move of venal Gamarala outstrips even the corruption indulged in by notorious crooked Rajapakses pertaining to the Mattala airport and Hambantota harbor projects during their most corrupt and crooked era. And now venal Gamarala is getting ready to spend Rs. 161160 million for a railway line which serves no purpose and promises no gain or profit. It is significant to note , the expenditure incurred by the SL Railways department possessed of experience to restore the 100 years old railway lines within 56 days following the Tsunami devastation was only Rs. 450 million. The sum spent by the SL railways department to construct 10 kilometers long railway line from Thandikulam to Omanthaya was only about Rs. 50 million or a little more per kilometer in 2010. Hence the expenditure of a sum of Rs. 18310 million per one kilometer mentioned in the cabinet paper of Gamarala is beyond belief and is most rudely shocking . In the circumstances , the only inference that can be made is , the entire aim of Gamarala before his exit is centered on earning filthy lucre and lining his pockets for which of course he has acquired a tremendous notoriety after coming to power . The corruption that beats all recorded corruption even putting Mahinda the world record breaker to shame ! It is crystal clear Gamarala who is aware his days are numbered as president wants to grab the maximum before his exit . He sees the railway project as the gold mine to achieve his crooked and corrupt aims and ambitions to fill his private coffers. 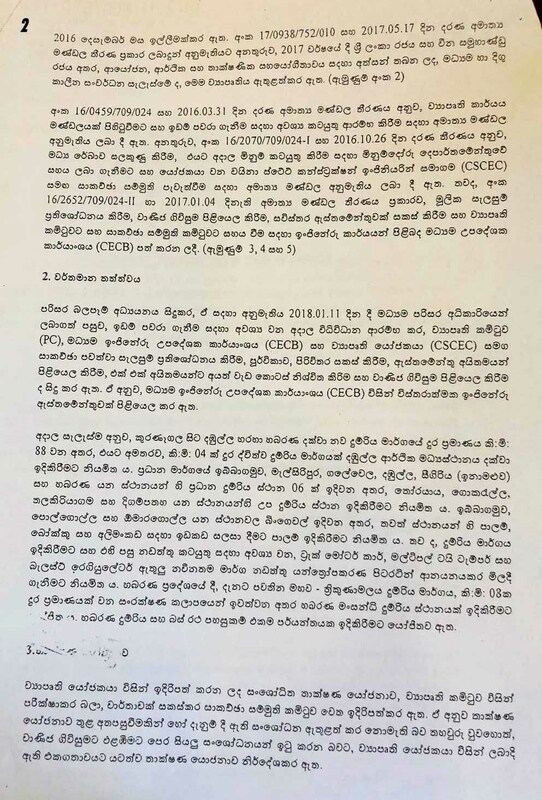 A copy of the controversial cabinet paper is below…Can be read by clicking on it after magnification.